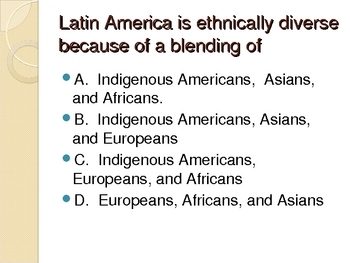 This is a power point presentation that features a multiple choice question on each of the 46 different slides. The questions are over Latin American history, geography, environmental issues, culture, government, etc. I use the questions as warm up activities but you can choose to use them as you please. (The answers to each question are in the notes section of the ppt.) Enjoy!